For some, it’s the number one rule to looking good. For others, it’s just about getting rid of that irritating texture. But all students and experts can agree that getting rid of dry skin is important not only to your skin’s appearance, but to your overall health as well. “When skin gets very, very dry, it’s more prone to infection or irritation,” said Dr. Paul Cohen, a board-certified Canadian dermatologist and a member of the Canadian Dermatological Association. According to Dr. Cohen, skin is your body’s barrier and your number one defence against bacteria in the world. If your skin becomes dried out and cracks, all kinds of bacteria can get in. It’s not only infection that drives people to get rid of their dry skin, however. Third-year York double major Santino Monachino says the reason a lot of people want to avoid dry skin is to impress romantic partners. “If your hands are red and scaly and you’re meeting a girl, it’s not going to go very well” said Monachino, noting you also want to avoid dry skin because it makes for awful handshakes in job interviews. But whatever your reason for avoiding dry skin, sometimes it’s inevitable. 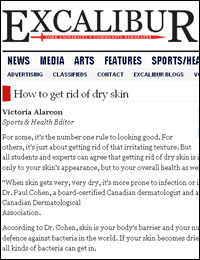 Canadian dermatologist Dr. Benjamin Barankin says people get dry skin for many reasons. “As we get older we produce plus oils naturally, so age is a major factor. Genetics play a role in dry skin as well, especially if enzema runs in the family – then you’re more likely to have it. If you have underlying conditions such as diabetes or you’re on certain medications that can dehydrate the skin, then that contributes as well,” he says. “Climate is probably one of the worst factors, so cold, dry air results in less humidity and less ambiance in the air outside. The cold weather outside also means we heat our homes, and when you heat your home it dries the air even further,” said Barankin. Though there are many ways to develop dry skin, there are also a lot of ways to maintaining smooth, healthier skin. Barankin recommends taking baths or showers that are not extremely hot or long because of how much moisture and oils leave your skin; however, Dr. Lisa Kellett, a Toronto-based dermatologist at DLK on Avenue, says if you really want to protect skin from getting dry, simply choosing baths over showers every time will make a big difference. Following the bath, Kellett says it’s important to put a barrier cream on top of the wet skin immediately after the bath, and when drying off, to pat dry instead of rubbing the skin. Barankin recommends not exposing the skin to cooler temperatures. Many people out for a run forget to put on extra layers of clothes and leave the skin open to the cold air. While baths and covering up is essential, the most effective way to keep skin moisturized is by remembering that age-old technique of applying lotion daily. While lotion will work, experts say to only apply lotion when your skin is wet or damp so that moisture can be absorbed properly. Barankin recommends applying lotion only after washing your hands. The best lotions contain shea butter, glycerin and dimethicone; avoid lotions that are highly scented or have alcohol. Dr. Kellett warns that while homemade lotions are also fine for the skin, they are not as effective as store-bought alternatives. The better decision is to set your eyes on the lotions that have all the ingredients you need for healthy skin. While winter is still upon us and spring a few weeks away, it’s important to keep the skin hydrated and smooth. Cetaphil restoraderm: Good – According to dermatologists, the lotion has something called ceramide, an important ingredient in our skin barrier – not a lot of moisturizers have it. Purell hand sanitizer: Bad – Alcohol can dry and irritate the skin, and won’t get rid of dry skin. Vaseline: Good – Though the product is greasy, it does in fact work, say experts. One ingredient, glycerine, works to bind water molecules and trap them in the skin. Nivea firming body: Good – The lotion contains vitamin E and shea butter, which are important ingredients to smooth skin, say dermatologists.